Sharing a wall, parking lot and at least one owner with Soulshine Pizza, The Slider House in Midtown seeks to fulfill the late-night munchie needs of Nashvllians as they spill out of bars in the area. With a last call for food at 3 a.m. scheduled to coincide with closing hours at marathon drinking spots, it might just be your go-to destination for late night cravings. Notice I said “your go-to destination.” Not that I didn’t like it on my first visit or won’t be returning. I just went for lunch since the last time I saw 3 a.m. was from the other side when I had to wake up early to catch a flight. Back to that parking lot, finding a spot for your jalopy can be tricky at any hour in Midtown, so The Slider House offers valet during most of the hours that they are open for $2. It would be worth the price just to watch the young valets from Soulshine, The Slider House and Chuy’s battle to find the few available legal spots left. 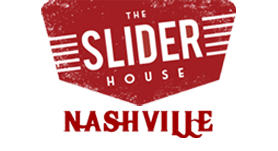 Visit the original Slider House open since 2013 and located in the Midtown area of beautiful Nashville, TN. 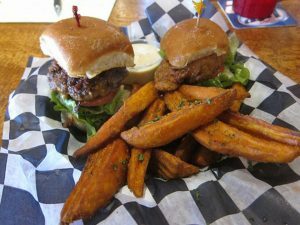 Full menu including our famous sliders, salads and more including vegetarian options. Full bar and indoor & outdoor dining with a view of all the action on Division St. Our patio is pet friendly so bring your furry friends, enjoy gourmet sliders and your choice of 100's of canned beers. The Slider House has been proudly owned and operated by STW Midtown, LLC since May 2018.